ध्येय: "ऐण्डरसन ग्रिज़लियों का घर"
↑ 1996 Alaska Municipal Officials Directory. 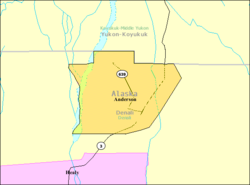 Juneau: Alaska Municipal League/Alaska Department of Community and Regional Affairs. January 1996. पृ॰ 25. ↑ 2015 Alaska Municipal Officials Directory. Juneau: Alaska Municipal League. 2015. पृ॰ 30. ↑ "Annual Estimates of the Population for Incorporated Places in Alaska". United States Census Bureau. 10 जुलाई 2008. अभिगमन तिथि 14 जुलाई 2008.